Like all our products AutoWorks has been developed to meet the specific needs of our users, with features and functionality determined by their requirements. Although AutoWorks is aimed specifically for businesses in the Vehicle Service Industry, it is a cross pollination of ideas from various other diverse business operations, that we have also developed systems for. No one industry or business has a monopoly on good ideas, and we welcome input from all our users, and apply them across the board where appropriate. AutoWorks has been developed in FileMaker, a very powerful and robust cross platform relational database development environment, and as a result we are able to quickly adapt our product to the ever changing needs of our users. AutoWorks is always evolving. AutoWorks is just another tool for the mechanics to use directly. It automatically generates Purchase Orders, on a job by job basis, carrying over full vehicle details ensuring correct parts are delivered, guaranteeing they are billed to the job and reducing costly mistakes. It even supports the automatic ordering of one off parts by using generic part numbers for each of your common suppliers for such products. 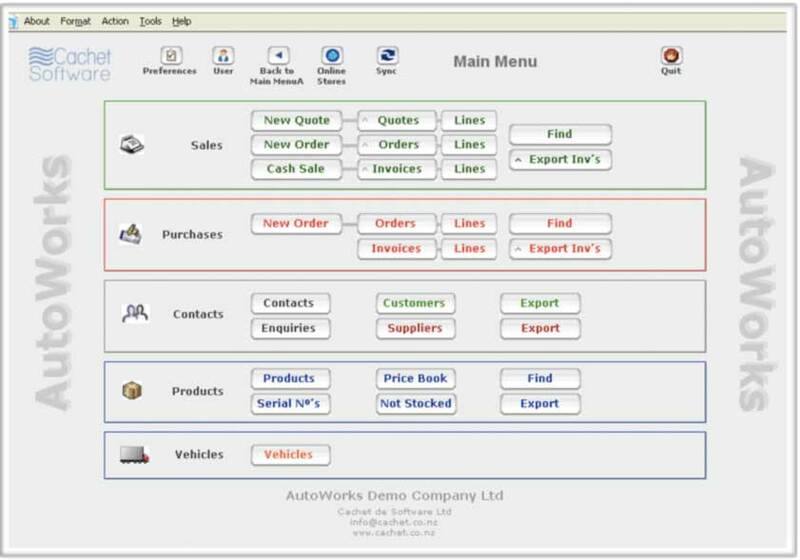 AutoWorks allows the mechanics to build their own story, explaining the work carried out, by pushing a few 'user' labeled buttons, that paste your own customised text content into the body of the invoice. This ensures a consistency of the message, of grammar, of spelling and of standards, and reduces time spent proof reading and correcting these stories. AutoWorks knows when a vehicle has been serviced, and automatically sets the reminder flags, to later print a set of reminder letters or produce a contact list so a follow up telephone call can be made. You can build your own personalised promotional letters, and send them out to all owners of model x from supplier y, where the odometer reading is greater than 100,000ks, advising them that now is the best time to replace those work widgets. AutoWorks lets you get on and do the work on a vehicle, and then decide whether the car yard, the warranty cover, the insurance cover or the customer are to pay for the parts or the work on a line by line basis, and lets you split the invoice by Debtor accordingly. It supports the auto splitting of excess $'s 'paid' and 'to pay' for insurance claims. AutoWorks allows you to view your stock holding status and history for stocked components, and automatically generate Purchase Orders on various Suppliers without ever having to type in a product code. Fast, easy, efficient, saves time and money.